Over a span of 20 years, Hans Dersch has written copy in advertising, marketing, public relations, fundraising, political campaigns and grant proposals. He holds a Bachelor of Science in Advertising from the University of Texas at Austin. Energy-saving light bulbs are replacing incandescent bulbs around the world. The higher initial purchase price is purportedly offset by long life and lower power consumption. GE energy-saving light bulbs, like most, are compact fluorescent bulbs. With United States law banning incandescent bulbs taking effect in 2012, and a European Union ban in place, energy-saving bulbs sound promising, but are not without dangers. On average, each GE energy-saving light bulb contains 5 milligrams of mercury. Mercury is a neurotoxin and classified as toxic waste. 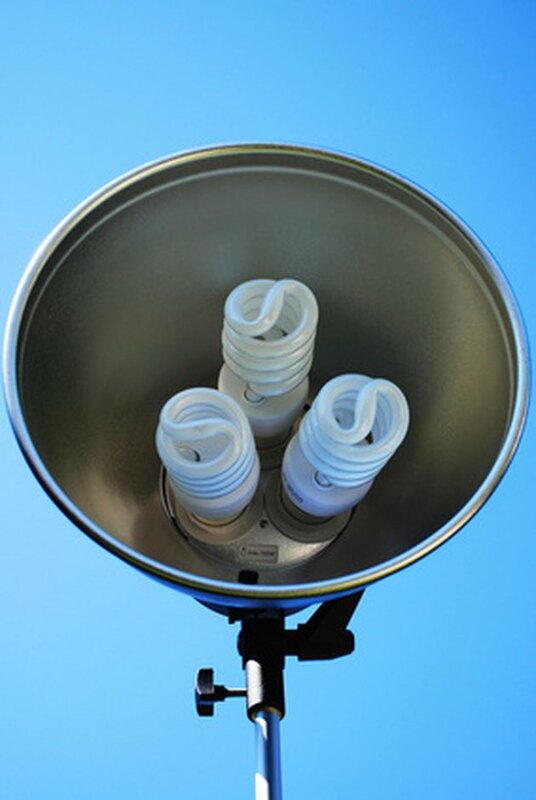 If a bulb breaks, the mercury is released into your home. Spills on carpets release dangerous levels of mercury into the air for weeks every time you disturb the area, including vacuuming. Broken and discarded fluorescent bulbs are predicted to release two to four tons of mercury into the environment every year, and in this case, the environment may include your living room. A GE energy-saving light bulb produces UV radiation. The harmful effects of UV light are known to cause skin damage and cataract formation. While your compact fluorescent bulb may not produce as much UV light as the sun, little research exists to evaluate long term risks to skin and eyes. The European Union recommends limiting exposure to compact fluorescent bulbs to no closer than one foot away for an hour a day. There have been reports of fires caused by compact fluorescent bulbs. In most cases the fire was the result of a bulb breaking while turned on; however, there have also been reports of fires started inside the ballast in the plastic base of the bulb. Because the ballast in many bulbs is not designed to function in a closed space such as a recessed fixture, you should only use bulbs specifically listed for such applications. In a small percentage of the population, the flickering inherent with energy-saving light bulbs causes headaches, nausea, and migraines. Workers exposed to natural light suffer less than their counterparts whose offices are illuminated with fluorescent bulbs. A frequently overlooked danger of energy-saving light bulbs is high cost. These bulbs are touted as long lasting; however, this rating is based on constant-on operation, not cycling on and off. Turning compact fluorescent bulbs on and off cuts their lifespan to that of a regular bulb. At a replacement of three dollars per bulb, economically disadvantaged people will be most harmed by the new mandate. Consider using GE energy-saving light bulbs in fixtures that remain on for long periods of time and which will not contaminate living spaces if they are broken. Consider also buying a large supply of incandescent bulbs.